A team of around 100 officials and employees of the Income Tax Department and policemen descended on the business and residential premises of a leading shawl manufacturer in the city in a bid to unearth concealed income. Glowing tributes were paid to Flying Officer Shaheed Nirmaljit Singh Sekhon and other martyrs who laid down their lives for the country during the 1971 Indo-Pak war, at a function organised to observe Vijay Divas at the mini secretariat here today. Improvement Trust on the lookout for astrologer! 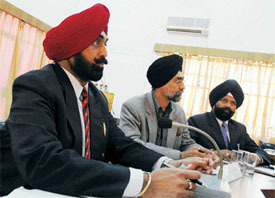 Stung by the loss of revenue in auction of trust properties in the past, the Chairman of the Ludhiana Improvement Trust, Mr Ashok Singh Garcha, has sought the help of an astrologer to predict auspicious dates for conducting the auctions. On a call given by the Employees Action Committee and Technical Services Union (PSEB), employees of the board today observed a strike at the east and west circle offices here. The city continues to be in the grip of thieves and snatchers, who strike during the daytime , round-the-clock patrolling by more than 100 PCR bikes notwithstanding. The latest victim is Mr Harbans Singh, who runs a machine tools manufacturing unit in Dashmesh Nagar. The Sahnewal police has arrested two persons and recovered fake currency from their custody last evening. The accused, Ram Avtar Verma of Shimla Puri and Mohinder Singh of Jagraon, were allegedly carrying fake currency worth Rs 13,100 in a vehicle when they were nabbed by the police. The Salem Tabri police raided a hooch still at Bahadurke village last evening and arrested two persons. The other, however, escaped. According to police sources, the police had received a tip-off that an illicit liquor still was in operation in the house of Beant Singh. 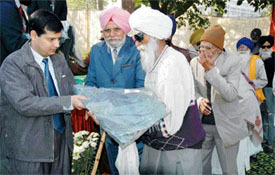 The economic condition of farmers in the country, specially in Punjab, has been deteriorating, asserted Captain Kanwaljit Singh, SAD general secretary and in charge of the function to observe the tercentenary of the martyrdom of the two younger sons of Guru Gobind Singh and Mata Gujri at Fatehgarh Sahib. Youngsters in the city seem to be getting carried away and partying these days. They seem to be on a shopping spree as Christmas and New Year is round the corner. Majority of the buyers are teenage girls. The Khalsa Panchayat has hailed the Justice department of the USA Government for issuing a poster about the Sikhs in which it has clarified their (Sikhs’) identity. In a statement issued here today, the urban district unit president of the Khalsa Panchayat, Mr Bhupinder Singh Nimana, said the poster would go a long way in clearing the misgivings about the Sikhs in the USA. For his outstanding performance during the census operations — 2001, Mr B.K. Gupta, Assistant Commissioner, Municipal Corporation, Ludhiana, has been conferred with the President’s silver medal. The Minister for Animal Husbandry and Dairy Development, Mr Jagmohan Singh Kang, today said that the Animal Husbandry Department would check samples of milk and milk products like cheese, butter and khoya. An expression competition was organised at Kundan Vidya Mandir Senior Secondary School, Civil Lines, Ludhiana, today. Children of LKG and UKG participated. They expressed their ideas on various topics such as “myself, personal cleanliness, my favourite teachers and TV serials”. The tiny tots exuded confidence. 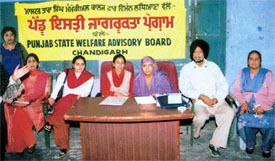 Awareness Generation Project—a five-day awareness programme being organised by Master Tara Singh Memorial College for Women and Punjab State Welfare Advisory Board got started at Government High School, Ladowal, here today. The Young Lawyers Welfare Association has announced to support Mr Kanwaljit Singh Bajwa, who is contesting for the post of secretary of the District Bar Association, in the forthcoming elections. The district health administration will lay more emphasis on national health programmes concerning children and women, besides immunisation, tuberculosis, leprosy, Aids and malaria programmes. The focus will be on creating awareness among the masses about these diseases as well as preventive and curative measures available. 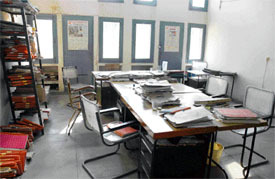 In the wake of attempts by some employees to disrupt the working of Dayanand Medical College and Hospital (DMCH) here, the hospital administration, while claiming that the institution was working normally, appreciated the staff of the hospital, which was working day and night to ensure welfare of patients and delivery of medical care to them.